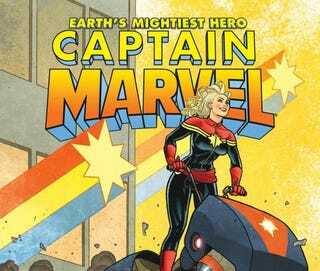 Captain Marvel (formerly Ms. Marvel), aka Carol Danvers, is a superhero from Marvel Comics. Her powers include superhuman strength, speed, and flight, among others. The series is written by Kelly Sue DeConnick. Issue 12 came out today and it was a good one. It was made up of scenes of her fighting the villain Deathbird interspersed with a pair of doctors talking about Carol's illnes. Carol has a brain lesion, which has been keeping her from using her flight powers, though she hasn't been dealing with that too well. The issue was engaging, even in the less action-y parts. And it doesn't hurt that the interior art done by Filipe Andrade is awesome.